Hi - i need a hint how you handle a Frame Sequenz with multiple Shots (different Camera Angels) of the same Scene. I multi copy the loader an Trim the Frames i needed, but how can i use the red marked comp in a later sequenze again? If i merge this it doesn't work because it only on Frame 0-250 present? Dissolves don't support ROIDS, so I'd avoid that route. What's going on that it's 250 frames but you want to reuse it twice? If it's just wind rustling through grass, then I'd do the TimeStretcher route and make a custom loop for it. Okay thanks. Since there are poor tutorials for Fusion I'am learning with Nuke and there is the FrameRange and AppendClip Node. 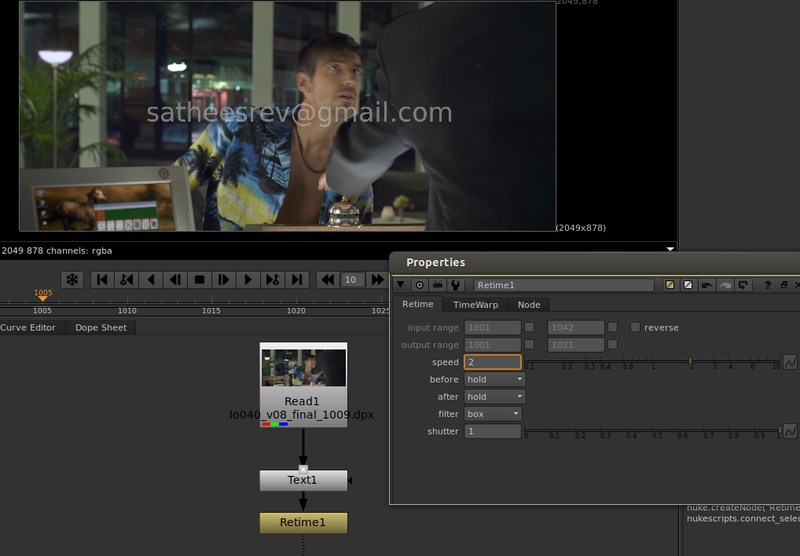 I'am gernal confused in Fusion how to handle a Sequence shot. The red marked 0-250 Frame is a animated cloud sequence, which should used timestreched in all Section as Sky Replacemant. The first and the last section is same Live Camera Angle, in all other it has to be modified. Copy and Paste would work, but you have to change everything in every copy. The TimeStretcher is a little faked so it has 500 Frames but must repeated in die middle so it shuold work with 700 Frames. But how do you get the red marked 0-250 to all Clips? You want to slow it down so that it's 3x longer? FlowSpeed will do that. Still not sure exactly what you want. I think Nuke's retiming tools are quite neat, and Fusion would benefit from something like Nuke's Retime (for everone who doesn't know it, it's perfect for solving problems like: "retime upstream so that the frame range 100 to 200 is now 500 to 550"). For now, you only have two options: TimeSpeed for constant speed-ups and frame offsets and TimeStretcher/FlowStretcher for time warps. So it's just a temporal normalize? Funny how trivial that is, but in the scheme of actually getting you the UI you need as quickly as possible, that's not such a bad idea. Two RangeControl sliders could do that very easily. That's how I do almost all of my normalizing tools. Wouldn't be that hard to make a Number modifier that could be used in the TimeStretcher that did just that. Again, stupidly simple, but sometimes that's all you want. I like the modifier idea! Should only use comp time as an input, right? So no need to expose that as a slider. So just 2 range controls an that's it? This would be really easy to do with an Expression modifier, too, but there isn't really a modifier equivalent to a macro is there? Like I can't save out a preset for Expression or Calculation and call it "Time Normalize" and have it show in the list of number modifiers, right? Yeah, a TimeStretcher with an expression modifier as a macro might be the most portable way for the basic functionality. I think modifiers can only be done as Fuses. Nuke's Retime tool has a bunch of other features that would be hard or impossible to put into an expression. For example, you can define what to show before and after the target range (hold, continue, loop). It also has a speed slider that gets automatically calculated when you have set up source in/out and target in/out numbers. But in addition to that you can decide not to define any of these values (for example, no source in. Just source out and target range) in which case the speed slider becomes unlocked. This would allow you to do things like "the input branch should be played back twice as fast and what used to be frame 100 should now be located at frame 500". The problem I hit when I experimented with range controls in a Fuse was that you can only lock the whole widget, not just one side of it. If you skip the user-defined speed slider it should be possible to use two range controls as you suggested. Maybe an additional button to reset the speed to 1.0 by modifying the target out number accordingly. That would remove the need for the user to do some math in his head. Nuke's retime is neat. I've been meaning to do a couple of retime macros to mimic this behaviour and a couple of other things. Could you do all of Nuke's FrameHold, TimeOffset, TimeWarp etc using one TimeStretcher node? Probably, with a ton of effort, but they sure are extremely convenient as separate tools, and they make the comp all the more legible. I've also missed a FrameHold in Fusion but this could be done as a macro based on TimeStretcher quite easily. Your screenshot reminds me of something else: The TimeStretcher's frame blending is really bad. It will only blend 3 frames. Nuke's TimeWarp and Retime nodes have this shutter setting which averages any number of frames depending on the speed. Plus there's the second timewarp curve that you can apply on top of your result, basically controlling how you go through your resulting frame range.